The Originals : Season 2 spoilers! H Julie Plec και ο Michael Narducci μας πληροφορούν για τις σχέσεις μεταξύ των χαρακτήρων αλλά και τις καταστάσεις που θα πρέπει να αντιμετωπίσουν. Ο τίτλος του 1ου επεισοδίου της 2ης season θα είναι '' Rebirth'' και αποτελεί κάτι βασικό που θα αφορά όλη την καινούρια season. Απο την μία ο Klaus και ό Elijah θα έρθουν αντιμέτωποι με τους γονείς τους και σύμφωνα με τον Michael Narducci ο Klaus kai o Εlijah θα καταλάβουν γρήγορα πως οι γονείς τους έχουν γυρίσει για να πάρουν εκδίκηση. HAYLIJAH : Δυστυχώς, η σχέση του Elijah Και της Hayley θα πάει ένα βήμα πίσω στην 2h season. Η Hayley και ο Klaus είναι τα μόνα υβρύδια που υπάρχουν πιά, και ο Elijah θα αναρωτηθεί αν υπάρχει μία ερωτική σύνδεση μεταξύ του αδελφού του και της Hayley που δεν θα μπορούσε να ξεπεράσει, σύμφωνα με τον Narducci. KLAUS: THE EARLY YEARS: Η καινούρια season, σύμφωνα με τον Narducci, έχει να κάνει με το να πολεμηθούν οι αμαρτίες του παρελθόντος. ''Εξαρτιόμαστε απο τους γονείς μας, αλλά όταν γινόμαστε ενήλικες , ξεκινάμε να επιλέγουμε τους δικούς μας δρόμους.Ο Klaus είναι ένα προιόν απο τον βίαιο πατέρα του, αλλά και της μητέρας του παράλληλα.'' Στην 2η season θα μάθουμε περισσότερα για τις αυθεντικές ρίζες του Κlaus , θα υπάρχουν πολλά flashbacks απο την παιδική του ηλικία, πολύ πριν γίνει βρυκόλακας. Όλα αυτά θα μας δείξουν την τότε σχέση που είχε με την μητέρα του, και το πως ένιωσε όταν η μητέρα του γύρισε απο τους νεκρούς και τον είπε ως βδέλυγμα. A WITCH’S CONFLICT: Απ'την άλλη μεριά, η Devina θα έχει πολλά ενδιαφέροντα πράγματα να αποκαλύψει στην καινούρια season. '' Έχει τον Mikael υπο τον έλενχο της, και θέλει ο Klaus να υποφέρει , αλλά παράλληλα αγαπάει τον Josh και τον Marcel και ξέρει ότι αυτόι είναι συνδεδεμένοι με τον Klaus. Θα πρέπει να φερθεί έξυπνα με τις αποφάσεις που θα πάρει σχετικά με τον Mikael. eirhnh patsiodimou 22 Ιουλίου 2014 - 1:33 π.μ. On Season 2 of The Originals, Klaus and Hayley are on a mission — and you better not stand in their way. During the Season 1 finale, Hayley (Phoebe Tonkin) gave birth and was immediately killed, only to wake up as a hybrid. But with the baby's life at stake, Hayley, along with Klaus (Joseph Morgan) and Elijah (Daniel Gillies), made the heartbreaking decision to give baby Hope to the only person they could trust with keeping her safe: Rebekah (Claire Holt). But for both parents, the devastating loss will be their drive and purpose when the show returns. The Originals Video: Is there hope for Hayley and Elijah? "Everyone has a different reaction to tragedy. Some people look to replace it with another love, some people focus on self-improvement, but Klaus has decided that he will only imagine a day when he'll be reunited with [Hope] while he destroys everyone keeping that child away from him," executive producer Michael Narducci tells TVGuide.com. "So he will make everyone [pay] and that's a very Klaus-ian response. Some people said, 'Oh, Klaus is so sensitive and emotional this season' and I like that stuff, but I feel like Joseph is so good at playing vindictive and dangerous and now he gets to be that with purpose." Hayley, meanwhile, was just coming into her own as a strong woman during the first season, but will essentially be broken upon the return. "In the early episodes, you will see her shattered," Narducci says. "There's postpartum depression and then there's postpartum depression when you've given up the baby, died and were reborn as a hybrid and you don't know what it's all about." She too will be laser focused on revenge, but like last year, Hayley will find herself once again without family. "The thing that defined Hayley in Season 1, besides interaction with the Original family, was her desire to find her family," he says. "She found her family and right at the moment when she connected with them and saw she had a purpose and a legacy to be a part of this werewolf pack, she's now completely severed from that connection to the point that those werewolves look at her as just another vampire. So what will her reaction be? [She'll] pull herself up from the depths of a very low place and find a purpose which is similar in some ways to what Klaus wants ... to make her enemies suffer. But she also has another agenda, which is really cool. tvd 22 Ιουλίου 2014 - 1:39 π.μ. eirhnh patsiodimou 22 Ιουλίου 2014 - 1:42 π.μ. EIde oti eixe epityxia h syntagh kai eipe na th xanaftiaxei kala o Elijah tha ginei akoma xeiroteros ap oti htan sth 1 season twra thymhthhke oti h gynaika kai mhtera tou paidiou tou adelfou tou einai apagoreymenh otan th filage enw kyoforouse to anhcaki tou htan ola ok e ? Mono gia ta flash backs giati tha mathoume perissotera gia to Klaus kai th sxesh pou eixe me tous goneis tou kai epishs elpizw akoma oti me kapoio tropo tha epistrecei to mwro !!! vampire-fun! 22 Ιουλίου 2014 - 1:50 π.μ. Με 0,6 και 0,7 που είχε φτάσει η σειρά για πρώτη σεζόν,είναι εγγυήση επιτυχίας για την δεύτερη το ίδιο plot. tvd 22 Ιουλίου 2014 - 2:17 π.μ. tvd 22 Ιουλίου 2014 - 2:18 π.μ. NA PE8ANEI O ELIZAH.....me neuriazei poly....megalh pswnara..!!! eirhnh patsiodimou 22 Ιουλίου 2014 - 2:28 π.μ. De thelw na pethanei alla thelw na ginei aytos o Elijah pou eixe erthei sto tvd kai htan dynamikos ,prostateytikos kai kyrios me ta koustoumakia tou kai tous leptous tou tropous alla parola ayta de distaze na pairnei kai kefalia enw sto originals spania vlepoume ayton ton Elijah antitheta vlepoume ena erwtoxtyphmeno Elijah me th mhtera tou paidiou tou adelfou tou exei xasei poly o rolos tou !!! vampire-fun! 22 Ιουλίου 2014 - 2:35 π.μ. Κι εμένα φίλε/η μου από δω και στο εξής,θα με νοιάζει μόνο το tvd. Κρίμα μόνο,γιατί είχε πολλές προοπτικές να γίνει κάτι άλλο. tvd 22 Ιουλίου 2014 - 2:41 π.μ. sto tvd kai mena m arese pio poly....de 3etrelenomoun vevaia....einai kapws spastikos....egw 8elw pisw th rebekah!!! tvd 22 Ιουλίου 2014 - 2:43 π.μ. tvd 22 Ιουλίου 2014 - 4:26 μ.μ. emena m aresei poly kai h hayley....to kltr 8a tan na 3anaginoun originals kai tvd ena 3ana!!! eirhnh patsiodimou 23 Ιουλίου 2014 - 12:51 π.μ. Emena pali h Hayley de m aresei katholou de th vriskw oute kalh san hthopoio oute to story ths mou gemizei to mati .Symfwnw apolyta ki egw tha hthela na epistrecoun sto tvd oi originals eedinan kyros alla dystyxws kati tetoio de tha ginei tha ginei mono an de paroun trith season oi originals kai an paei to tvd gia evdomh season . vampire-fun! 23 Ιουλίου 2014 - 1:22 π.μ. Κι εγώ την λατρεύω την Χέιλι.Και τις ανύπαρκτες υποκριτικές ικανότητες της. Ούτε 5 λεπτά δεν μπόρεσα να χαρώ τον θάνατο της.Κατευθείαν αναστήθηκε. Στο tvd τουλάχιστον τους κρατάνε περισσότερο καιρό πεθαμένους. eirhnh patsiodimou 23 Ιουλίου 2014 - 2:53 π.μ. xaxxax kouragio kapoia stigmh h epithymia mas tha ginei pragmatikothta arkei na exoume ypomonh !!! eirhnh patsiodimou 23 Ιουλίου 2014 - 3:03 π.μ. After being controlled by pretty much everyone except herself all last season, Davina got the upper hand at the end of the Season 1 finale by bringing Mikael back from the dead ... with a catch. She controls him, not the other way around. "It's that old, Marvel/Spiderman saying: 'With great power comes great responsibility,'" executive producer Michael Narducci tells Zap2it. "With access to the most dangerous weapon, monster, destroyer, ever, people are going to get interested in what she has. People are going to start to come after her and she's going to decide how she wants to use this great power that she has." So what will Davina decide to do with Mikael? "Does she want to send Mikael after Klaus?" Narducci wonders. "If Mikael kills Klaus, all of the vampires Klaus sired will die, including Marcel and Josh, so she can't really allow that to happen. She's got to figure out what her next move is. At the same time, everyone wants to know where she is, what she's up to, because not only does she have Mikael, she has the white oak stake. So everyone will be after her for a while. How she responds to that is going to be a big arc for her character, to grow up and take responsibility for her actions." Since Narducci brought up everyone's favorite character, Josh, we had to push him for more details on what's coming up for our favorite "gay club kid who came back as a vampire." And what he told us almost caused us to have a heart attack. "He dies in the first episode," Narducci deadpans. "I'm just kidding! We love Josh." Understatement of the year. "He is a newly-turned vampire who has a very fresh perspective on, 'What is this world, why am I here? I can't go anywhere else, I know who the good guys are, I know who the people I trust are, and I'm going to do whatever I can to help them,'" Narducci says. "He's going to have some great scenes coming up with Marcel and Davina and Cami and maybe he might even have a romantic interest down the line as well." 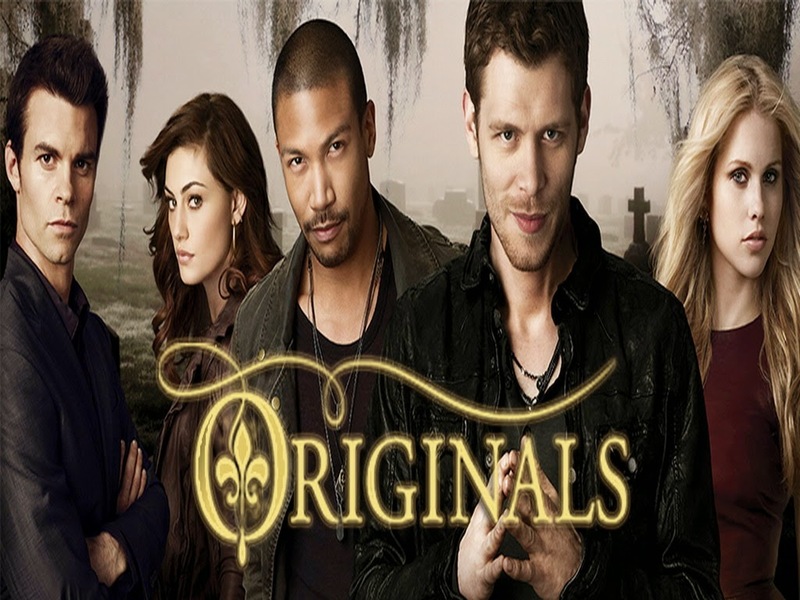 So what is Narducci most excited for fans to see from "The Originals" Season 2? It's actually something we'll get to see pretty soon. "Immediately as you asked, the first thing that popped into my mind was that I'm really excited for our fans to see our Comic-Con trailer," Narducci says. "I think it's really awesome and it gives you a sense of what the season is going to be about. Now that we're bringing back Mikael, Esther and one of the brothers (and I won't say which one), we're going to play up and explore all of those complicated family connections and I think it's going to be fun." SORRY ALLA VARIEMAI NA TO METAFRASW ELPIZW NA TO KATALAVAINETE OLOI !!! vampire-fun! 23 Ιουλίου 2014 - 8:23 π.μ. Οτι να ναι.Αφου το ξέρουμε οτι δεν γίνεται να σκοτώσουν τον Κλαους,ποιος ο λόγος να ξαναφέρνουν πίσω τον Μαικλ;Δειξτον σε φλασμπακς μόνο,γιατί εκτός του οτι την έχουμε ξαναδεί την ιστορια στο tvd,δεν αξίζει να κανεις σκυλάκι της Νταβινα εναν τέτοιο χαρακτήρα. Και για την Εστερ τα ίδια ισχύουν.Αφου απέτυχε να σκοτώσει το μωρό και δεν πρόκειται να σκοτώσει τον Κλαους,ποιος ειναι ο λόγος της επιστροφής της;Αφού πάλι δεν θα το σκοτώσει το μωρό μάλλον. Ούτε καν την Χέιλι δεν κατάφερε να σκοτώσει. Ο Josh ειναι η πιο ευχάριστη νότα της σειράς.Για αυτό ειναι αρεστός σε πολλούς αυτός ο χαρακτήρας. tvdlove 23 Ιουλίου 2014 - 2:27 μ.μ. tvdlove 23 Ιουλίου 2014 - 2:34 μ.μ. fusika k dn 8a pe8anei o klaus opoion k na feroun.einai o prwtagwnisths.se oles tis seires o prwtagwnisths den vgainei apo th o8onh s!alla prepei na fereis kapoion na tarakounhsei ta pragmata akomh k an ksereis oti sto telos 8a th glitwsei o klaus.o logos ths epistrofhs tous einai opws elege k to trend sto twitter "we want more originals at the originals".mia fora ekanan kati pou zhthse o kosmos.as mhn tous kathgoroume k gia auto,exoume polla alla!vevaia den prokeitai na katsoun polu,to polu mia sezon k oute,mish mh s pw alla tespa 8a prospa8hsw na to apolausw oso krathsei.apo to ka8olou kati einai k auto. vampire-fun! 23 Ιουλίου 2014 - 4:33 μ.μ. Ναι,more Originals είναι και ο Κολ που θα μπορούσαν να τον φέρουν ζωντανό.Είναι και φλασμπακς που μπορούν να δείχνουν με Έστερ και Μάικλ.Αμφιβάλλω αν θα εμφανίσουν καν την ηθοποιό που έπαιζε την Έσθερ. Ο Μάικλ είδικά θα είναι υποχείριο της Νταβίνα.Κάτσε μην τον σκοτώσει καμιά Χέιλι στο τέλος!Το μόνο που θα προσφέρει είναι ότι θα ταράξει η παρουσία του τους αδερφούς. Τελοσπάντων,απόψεις.Εμένα μου αρέσει πολύ ο Τζος και η Νταβίνα.Ήταν οι πιο ευχάριστες παρουσίες της σειράς,για τα δικά μου γούστα.Αλλά να έχει υποχείριο τον Μάικλ,δεν μου αρέσει σεναριακά,για αυτόν τον χαρακτήρα και τον ηθοποιό,που είναι πάρα πολύ καλός ομολογουμένως! tvd 23 Ιουλίου 2014 - 4:44 μ.μ. christinJM 23 Ιουλίου 2014 - 11:06 μ.μ. τελος παντων να ζήσουν ευτυχισμενοι!!! tvdlove 23 Ιουλίου 2014 - 11:08 μ.μ. o kosmos den elege mono ton kol.proswpika k egw auton 8elw pio pl alla k oi goneis den me xalane.o klaus mporei na skotw8ei me to white oak stake alla den 8a skotw8ei epeidh einai o prwtagwnisths opws ginetai se ka8e seira. nomizw pws 8a emfanistei h kanonikh esther toulaxiston se flashbacks gt eipan oti 8a doume th sxesh tou klaus ws paidi mazi ths.tespa apla mono gia auto den 8a kathgorhsw tous senariografous gt ousiastika ekanan mia fora kati pou h8ele o kosmos.eidika ton mikael ton zhtousan gt htan polu ligo sto tvd k mono mia skhnh eixame dei mazi tou me ton klaus.den kserw an paliotera evlepes sxolia h akoma k sto youtube sth skhnh pou pe8ainei lene oti ton skotwsan polu grhgora.h esther entaksei,egw an k proswpika mou aresei pou thn eferan gt 8elw na dw ti 8a kanei k me ton mikael pou den tous exoume dei ka8olou mazi autous tous duo sth neoterh epoxh,katalavainw oti epaikse perissotero k isws kapoioi opws esu th variountai. tvdlove 23 Ιουλίου 2014 - 11:11 μ.μ. eirhnh patsiodimou 23 Ιουλίου 2014 - 11:48 μ.μ. Symfwnw s ayto pou les gia tthn Esther kai ton Michael giati einai toso dynates proswpikothtes kai oi dyo kai den axizoun na ftasoun sto shmeio na ginoun ypoxeiria kapoiwn allwn xilies fores na tous edeixnan se flashbacks to pws katadiwkan kai oi dyo to Klaus kai tous ypoloipous para na epanalavoun to idio story an kai de me xetrelainei na epanalhfthei gia allhh mia fora to story ths ekdikhshs xairomai pou tha tous dw akomh kai ypo aytes tis synthhkes . H Davina einai mia xexwristh proswpikothta mou aresei o xarakthras ths kai tou Tzos einai eyxaristes notes sth skoteinh atmosfaira twn originals !!! vampire-fun! 24 Ιουλίου 2014 - 12:33 π.μ. Μα φυσικά και δεν σκοτώνεται ο πρωταγωνιστής.Αλλά δεν έχει νόημα το ίδιο στόρι.Η Έστερ είχε νόημα,γιατί σκόπευε να σκοτώσει το μωρό,όχι τον Κλάους αυτή τη φορά.Απέτυχε.Και διάβασα ότι ο σκοπός της τώρα που θα εμφανιστεί μετά τις μάγισσες,θα είναι να σκοτώσει το μωρό.Αν το σενάριο θέλει να είναι σοβαρό,η Πρώτη Μάγισσα αυτό θα έπρεπε να είναι σε θέση να το πετύχει τουλάχιστον. Αλλά δεν θα το πετύχει εφόσον το πήρε η Ρεμπέκα και δεν πρόκειται να ακολουθήσουν αυτή την ιστορία όπως είπε η Τζούλι.Άρα μηδέν εις το πηλίκον φαντάζομαι. tvdlove 24 Ιουλίου 2014 - 12:54 π.μ. vampire-fun! 24 Ιουλίου 2014 - 12:59 π.μ. Γιατί όχι;Αφού παρουσιάστηκαν ως adult and more darker show. Ενώ το tvd ήταν teen drama.Έτσι δεν έλεγαν;Δεν φταίω εγώ που έχω απαιτήσεις λοιπόν.Όχι πως δεν κατανοώ τι ακριβώς λες. eirhnh patsiodimou 24 Ιουλίου 2014 - 1:12 π.μ. De to hxera oti exei korh ayth vasika sthn hlikia pou einai logiko einai na exei paidia .Elpizw pantws o Joseph na phre th swsth apofash kai na mh katastrecei aytos o gamos th kariera tou giati tote tha to metaniwsei pikra kai tote o gamos tha paei peripato . eirhnh patsiodimou 24 Ιουλίου 2014 - 1:22 π.μ. h alhtheia einai oti to originals elegan oti apeythynetai perissotero se enhlikes para se efhvous epeidh ypotithetai oti tha htan pio skoteino ,aimathro tromaktiko kai elaxistes scenes eidame tetoies . Egw perimena na dw tous originals me ta vampirika tous proswpa ki aytoi mou edeixnan ton Elijah pou htan erwteymenos kai to Klaus na klaiei synexws kai to apokoryfwma h apoxwrhsh ths Rebekah alla mas elegan ki alla mas edeixan elpizw na mh mas kanoun kai twra to idio . vampire-fun! 24 Ιουλίου 2014 - 1:31 π.μ. Τι να σου πω κι εγώ.Δεν καταλαβαίνω την βιασύνη του.Είναι νεότατος για άντρας και για σταρ. Και δεν με ενδιαφέρει να είμαι political corect όπως κάτι κουλά που διαβάζω,πόσο χαριτωμένους και ταιριαστούς τους βρίσκουν. Δεν είναι καθόλου ταιριαστοί σαν εικόνα.Ούτε με ενδιαφέρει αν είναι καλό άτομο η Persia,που ενδεχομένως είναι.Οκ για σχέση,αλλά αρραβώνας και γάμος;;;Please. Τον απομυθοποίησα ήδη σαν άντρα και είμαι και ενήλικο άτομο. tvdlove 24 Ιουλίου 2014 - 1:39 π.μ. to ftiaxnoun oi idioi pou ftiaxnoun k to tvd omws.poio adult einai apo thn apopsh oti den uparxoun sxoleia k mono enas ente duo efhvoi pou den einai oi pio vasikoi.twra more darker apo to tvd den to vlepw.isws oi prwtagwnistes k oi istories tous einai pio dark kata ta alla oi idies dolofonies ktl me to tvd einai. eirhnh patsiodimou 24 Ιουλίου 2014 - 1:43 π.μ. oti kai na poume egw ki esy o Joseph to kane kai den allazei apla eyxomai ayto to vhma na mhn apovei moiraio gia th kariera tou makari na mporesei na syndyasei eytyxismenh oikogeneiakh zwh kai kariera !!! eirhnh patsiodimou 24 Ιουλίου 2014 - 2:00 π.μ. Emena mou arese ap thn arxh genika th sympathhsa sa xarakthra kai ston thanato ths eixa lyphthei poly eytyxws poy thn epaneferan tha einai ena point gia th deyterh season !!! tvdlove 24 Ιουλίου 2014 - 2:12 π.μ. vasika mou thn espage ligo alla meta otan to ksanaeida thn sumpa8hsa.prepei nomizw na exoume katanohsh gt ena efhvo koritsi einai pou to mono pou ekanan einai na th xrhsimopoioun oloi. eirhnh patsiodimou 24 Ιουλίου 2014 - 2:23 π.μ. Akrivws egw th dikaiologw apolyta kai den ekane kai tipota tragiko edw pou ta leme alloi exoun kanei xeirotera . Mou arese poly h scene pou eixe deixei th dynamh ths kai tous erixe olous katw kai to Klaus kai ton Elijah kai to Marcel . vampire-fun! 26 Ιουλίου 2014 - 1:52 π.μ. Η Claire φαίνεται ότι ίσως συμμετέχει και σε κάποια άλλη σειρά. Μπράβο της αν είναι αλήθεια.Είναι καλή ηθοποιός. tvdlove 27 Ιουλίου 2014 - 5:41 μ.μ. vampire-fun! 27 Ιουλίου 2014 - 6:07 μ.μ. Τα ειδα κι εγω,αλλα φοβάμαι ακόμα να τα πιστέψω.Θελω λίγο χρόνο να το επεξεργαστώ. Εντούτοις,παρατήρησα μια αλλαγή γενικά σε σχέση με το θέμα. tvdlove 27 Ιουλίου 2014 - 6:39 μ.μ. vampire-fun! 27 Ιουλίου 2014 - 6:55 μ.μ. Ναι,το είχε κάνει στο tvd. Οι μόνες γυναίκες που γνωρίζουν για την επιρροή της Καρολάιν στον Κλάους,είναι η Έστερ και η Ρεμπέκα. Συγκεντρώνει πιο πολλές πιθανότητες η Έστερ γιατί έβλεπε τα πάντα ως πρόγονος μαγισσών. tvdlove 27 Ιουλίου 2014 - 7:15 μ.μ. vampire-fun! 27 Ιουλίου 2014 - 7:24 μ.μ. Ο Μάικλ δεν μου πέρασε από το μυαλό καθόλου.Ναι,μπορεί και αυτός να παρακολουθούσε από την άλλη πλευρά,τόσο που τον μισεί. Απλώς την Έστερ την έχουν δείξει να τον χειραγωγεί συναισθηματικά με το θέμα αυτό,προκειμένου να τον παρασύρει σε παγίδα. tvdlove 27 Ιουλίου 2014 - 7:32 μ.μ. vampire-fun! 27 Ιουλίου 2014 - 7:35 μ.μ. Πω,πω,αν είναι ο Μάικλ,δεν θα είναι καθόλου καλή η αναφορά στην Καρολάιν. Του στυλ "nobody cares about you anymore boy".Ξέρεις πόσο σκληρός μπορεί να γίνει ο Μάικλ.Τότε δεν τον συμπαθούσα και πολύ τον Κλάους,αλλά όταν του είχε πει αυτή την ατάκα,πραγματικά τον λυπήθηκα.Είναι πολύ σκληρή φράση,ακόμα και για τον Κλάους. tvdlove 27 Ιουλίου 2014 - 7:44 μ.μ. nai leei kati logia k autos o mal***,gt auta pou tou elege ekei otan htan paidi?den masaei autos,ama einai na einai na pei tpt gia thn caroline,provlepw amesws vrisimo gia to proswpo tou apo to klaroline fandom. vampire-fun! 27 Ιουλίου 2014 - 7:50 μ.μ. Μπα,όλοι τον ξέρουν από το tvd τον Μάικλ.Το βρίσιμο στη Τζούλι θα πάει. Όμως μπορεί να είναι και κάποιος άλλος.Θα έλεγα ο Ελάιτζα,επειδή θα αρχίσει να αναρωτιέται για το αν μπορεί να είναι με την Χέιλι και ίσως συζητήσει σχετικά με τον Κλάους,αλλά επειδή ποτέ δεν ακούσαμε μέχρι τώρα να λέει οτιδήποτε,τείνω κι εγώ στην Έστερ.Αυτή ξέρει τα πάντα για τα παιδιά της. tvdlove 27 Ιουλίου 2014 - 7:53 μ.μ. vampire-fun! 27 Ιουλίου 2014 - 7:57 μ.μ. Που το έμαθε στο Originals;Δεν θυμάμαι κάτι.Μήπως δεν γνωρίζει και τίποτα ούτε τώρα. Δεν ξέρω αν είδες τη συνέντευξη του Narducci που είπε ότι κάποια στιγμή,θα πρέπει κάποιος να ειδοποιήσει την Ρεμπέκα για τον κίνδυνο και θα δούμε τότε τι γίνεται εκεί και που είναι. Δεν ξέρω αν θα γίνει στα πρώτα 3 επεισόδια.Πιστεύω αργότερα όμως ότι θα συμβεί. tvdlove 27 Ιουλίου 2014 - 8:07 μ.μ. otan hr8e o tyler k ekshgouse ston elijah o klaus ti exei sumvei me auton k ton tyler,eixe pei "i went after his girl",oute kan to onoma ths eixe pei se auton alla tespa. a wraia!k egw pisteuw argotera an einai 8a sumvei auto.an h claire ontws paiksei sthn kainouria seira epeidh den exei anakoinw8ei akomh to onoma ths epishma sto cast ths seiras(exoun vgei eksi h8opoioi alla oxi auth),isws xreiastei kapoios xronos gia na kanei k ekei gurismata alla einai mini-seira me 13 epeisodia opote uparxei logika xronos kai eidika an den exei k prwtagwnistiko rolo.k o daniel gillies o kahmenos se 2 seires phgainoerxetai. vampire-fun! 27 Ιουλίου 2014 - 8:12 μ.μ. Τα έχει απωθήσει αμυντικά φαίνεται η μνήμη μου. Και την καινούρια σειρά να ξεκινήσει,θα βρει χρόνο για 1-2 guest.Δεν νομίζω να της είναι πρόβλημα.Για regural δεν την περιμένω.Δεν θέλει,θέλει να προχωρήσει και της αξίζει η αλήθεια είναι. tvdlove 27 Ιουλίου 2014 - 8:17 μ.μ. e liga guest 8a ta kanei sigoura den einai provlhma nomizw.nai mwre einai kalh h8opoios k 8a htan wraio na kanei kainouria pragmata alla ela pou egw th 8elw ws rebekah.pe8ainw gia klebekah scenes alla k genikotera einai apo tous agaphmenous mou xarakthres,oses k an fernoun k prospa8oun na tis kanoun sassy klp opws einai h rebekah den to petuxainoun idiaitera. vampire-fun! 27 Ιουλίου 2014 - 8:31 μ.μ. tvdlove 27 Ιουλίου 2014 - 8:54 μ.μ. k emena mou ths espase ligo auto to senario ths prodosias alla tespa,isws tou xreiazotan ena tarakounhma tou klaus,an k den pisteuw oti h rebekah 8a afhne pote ton klaus na pe8anei,na ton timwrhsei nai alla oxi na pe8anei oute kan sto tvd tote me ton mikael,an den thn eixe maxairwsei h elena 8a allaze gnwmh pisteuw.skeftatai k prattei epipolaia kapoies fores alla ta metaniwnei meta. vampire-fun! 27 Ιουλίου 2014 - 9:22 μ.μ. Ναι,θα άλλαζε γνώμη αν δεν την μαχαίρωνε η Έλενα και για αυτό και την μαχαίρωσε άλλωστε.Όμως τότε ο θυμός της ήταν δικαιολογημένος.Την είχε στο φέρετρο μαχαιρωμένη από το Σικάγο και μετά ανακαλύπτει ότι ο Κλάους είχε σκοτώσει τη μητέρα τους και της είπε ψέμματα,την οποία μητέρα τους την αγαπούσε η Ρεμπέκα μέχρι τότε.Αλλά και πάλι με βαριά καρδιά τους βοήθησε να παρασύρουν τον Κλάους. Μπορούσε απλά η Τζούλι στο Originals να την βάλει να φέυγει για να ζήσει όπως θέλει τη ζωή της.Τελευταία είχε πάει εξάλλου και όλο δήλωνε ότι βρίσκεται προσωρινά εκεί.Είδες,δεν δώσαμε σημασία σε αυτές τις λεπτομέρειες τότε.Δεν χρειαζόταν τόσες προδοσίες.Της χάλαγαν το χαρακτήρα. tvdlove 27 Ιουλίου 2014 - 10:58 μ.μ. vampire-fun! 27 Ιουλίου 2014 - 11:40 μ.μ. Για τον Μαρσέλ,δεν μου άρεσε που τον πρόδωσε δεύτερη φορά τον Κλάους,στο River in Riverse. Όχι,μετά από ότι έγινε και που κουβάλησε τον Μάικλ την πρώτη φορά και αναγκάστηκαν να φύγουν από εκεί.Δεν την δικαιολόγησα εκεί.Θα έπρεπε να έχει μάθει το μάθημα της ήδη. vampire-fun! 29 Ιουλίου 2014 - 9:28 μ.μ. Εδώ η Τζούλι,επιβεβαιώνει αυτό που είπε και ο Narducci.Ότι κάποια στιγμή θα δούμε την Ρεμπέκα εκτός Νέας Ορλεάνης.Δεν πρόκειται να γυρίσει πίσω στη 2η σεζόν.